USC will play Georgia Tech (6-7) in the Hyundai Sun Bowl on December 31 in El Paso, TX. The game will kickoff at 11 a.m. PT and you can watch it live on CBS. 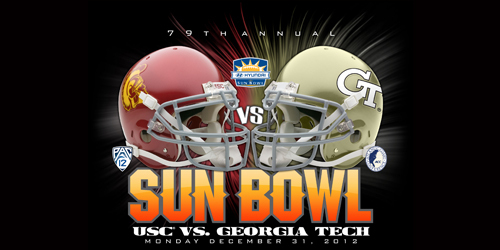 The last time the Trojans played in the Sun Bowl they lost to TCU 28 – 19. They also played Michigan State in 1990 and lost 17-16. USC is 2-1 vs. the Yellow Jackets but they haven’t played since 1973. Click here if you are interested in getting tickets.